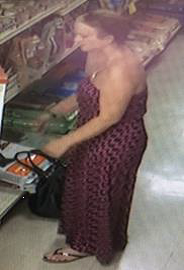 Paso Robles police are looking for a 24-year-old woman who allegedly snatched an eleven week old English bulldog puppy valued at $900.00 from a pet store on Sunday. At about 2:40 p.m., Allison Rae Trammel of Atascadero took the puppy out of its enclosure and hid it under her one piece dress, police said. Trammel then left the store, according to video from the Pet Department on 6th Street. 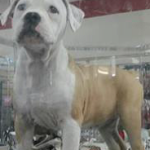 After determining Trammel was the likely suspect, Police investigators located the puppy at a residence in Paso Robles and returned it to the pet store. The tan and white puppy was in good health. Police are looking for Trammel, who is possibly driving a red or maroon colored Kia Optima. Police are asking anyone with information about this case to call the Paso Robles Police Department at 805-237-6464. Puppy thief from store video. Is there a ransom? Pray for the safe return of the bulldog to his cage! The stupid criminal is an idiot. She didn’t think about the store having video? The County D.A. should throw the book at her. No dog is worth $900! Don’t buy dogs at a pet shop, the animal shelter has plenty of good dogs!